This Fascinating Rhythmic stage play production tells the life story of the First Lady of Jazz – ELLA FITZGERALD! This show is filled with songs of yester-year and will make you want to swing, boogie, Lindy hop and jitterbug to the bee-bop sounds of a stellar musical band right from your seats! 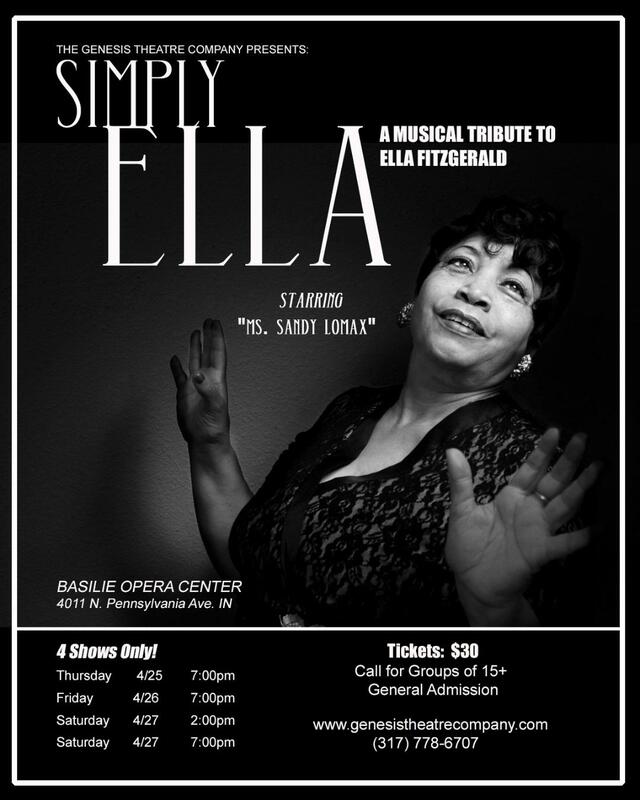 “SIMPLY, ELLA”, presented by the Genesis Theatre Company, stars Indy’s own Ms. Sandy Lomax, the Iibada Dance Company and some of the city’s most talented Actors and Musicians – who all help to bring this one of a kind stage show to the Basile Opera Center. Travel back to November 21, 1934 when a young Ella Fitzgerald (played by Kyla Archey) would enter her name into the drawing for a chance to perform at Amateur Night on the world famous stage of the historic Apollo Theatre. Witness the people in Ella Fitzgerald’s life who all had a hand in helping to propel her to the sweet status of stardom! Hear songs like “It Don’t Mean a Thing If It Ain’t Got That Swing, Fascinating Rhythm, The Lady is a Tramp and many, many more! The smooth lyrical tones of Ms. Sandy Lomax – who stars as Ella Fitzgerald, is sure to “simply take your heart away” – and is 2nd to none! “SIMPLY, ELLA” is a family friendly show (please, no children under age 4) and will be talked about for years to come! This show opens on what would’ve been ELLA FITZGERALD’S 102ND Birthday (April 25, 1917) – with an optional VIP Reception. Local and Stellar Talent incorporates this exciting and moving Musical as this original production hits the city of Indianapolis for the 1st time! Brown-Webster has assembled an exceptional cast filled with some of Indy’s finest Actors, Singers and Musicians to tell this story – and in honor of Women’s History month – Don’t Miss “Simply, Ella” – A Musical Tribute to Ella Fitzgerald”. TICKETS SOLD ONLY THROUGH GENESIS THEATRE COMPANY NO TICKETS WILL BE SOLD THROUGH THE BASILE OPERA CENTER.